The Lodgepole Log collection adds rustic character over standard log bedroom sets and features the highest quality construction available built by local craftsmen. Nightstands, Chest of Drawers, & Dressers feature solid wood construction and optional premium upgrades include full extension drawer glides and thicker posts. This collection is available in many different stains and customizable dimensions! We show our most popular options below, but note that all pieces can have more or less drawers which will adjust the price higher or lower. Allow approximately 4-6 weeks to build and ship. Includes Stain and Bark - Subtract 10% if not needed. 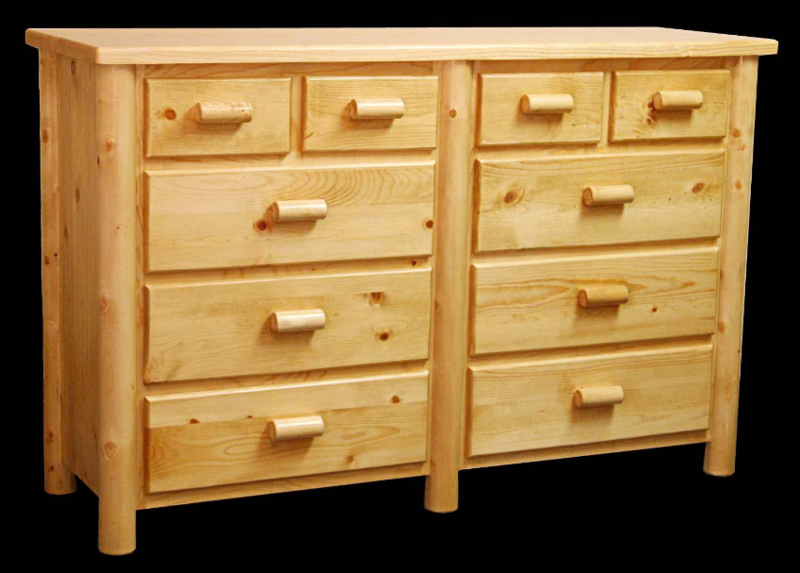 Add $100 for 4 Pine Tree Carvings on the top drawers. Includes Stain and Bark - Subtract 13% if not needed. Visit this page to view our Call-of-the-Wild Collection that is interchangable with this set! Arched and Canopy Beds Avail for a slight upcharge!